I'm selling my scanner from my car. Anyone who wants to buy it, just email me. Ok, I'm having trouble here. Does KITT have a GT500 spoiler or a V6 pony package spoiler? And does anyone have any ideas about front licenes plate mounting, for the states that require it? There is a company that makes a hide away plate mount but that might be hard with the lowness of the car. Cause here in Texas, the cops do not like you not having it ON THE FRONT BUMPER. Really need help here on the spoiler part. Hey, It's a V6 Pony Package spoiler. On the lic plate frame, Ford does have one for the Shelby front end. We have two plates here in ILL but I didn't want to put the holes in the bumper, I don't have a front plate and now watch me get stoped.hehehehehe. I've been doing the same with the license plate. I live in Texas & I don't have a license plate frame for my stang. I have it kinda stuck to the glass by the dash with this 2 way sticky glue. I've been pulled over & I've told them I'm not ruining my front fascia with an ugly license plate. I get warnings but that's all the state DPS officers do. In the city, the po po don't mind it since it's visible in the winshield. the last 2 years KRFest 2&3 (KRFest 3 with my KI2T replica & A-Team van), I've recently acquired an 08 Mustang GT. I've managed to get a set of the 18" 2010-11 wheels that closely resemble the correctly used 20" ($2K set) wheels. Needless to say, I'm happy as others' views of the car around here as well. I also picked up a rear GT500 spoiler (also via ebay) for $60 (granted I had to paint it). but I've been reading and watching this thread... and I too am looking at buying the parts. the KI3T scanner bars. Can someone help tell me what they are? expired.. So I ask, can some of you repost the sellers ID on Ebay where the items are expired after 90 days? Any and all help is greatly appreciated.. Oh and one last thing... THANK YOU guys (and gals) for "Making A Difference". Hello Mike, your friend John here. Hit me up on Facebook. As the owner of one of the most screen accurate KI3K Mustangs, I think I can help you out. Sorry for my absence my fellow Knight Riders, I have been busy with alot in my personal life as well as making time for working on my KI3T replica. My outside conversion is almost complete. I have gone through the following changes so far since I have started the Replica Process- Front bumper, rear bumper, spoiler, side stripes, racing stripes, both in the Matte Black, Snake emblems on the fenders and the trunk emblem, and of coarse, the Trufiber Venom Hood with twist lock pins which Im sure we all agree is the best hood for the conversions so far. I have just ordered my Alcoa rims and waiting until after winter to have them put on. I recommend that if anyone is going with the Alcoa rims, you jump on it ASAP since they no longer make these anymore and whats left in stock at retailers is all thats left. I heard also that these Alcoa rims are popular with Corvette owners and they are going fast. I purchased mine at Champion Mustangs and I am very pleased. I thank you all for your information in helping me with my replica process and if any upcoming replica builders need any information, Im happy to assist along with everyone else here Im sure! 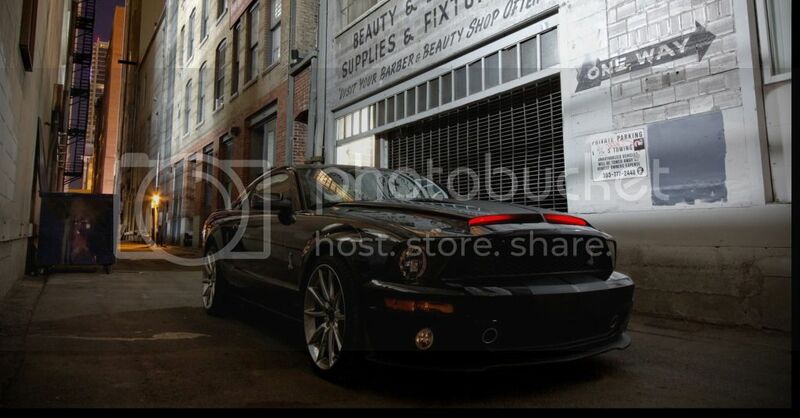 i ordered my alcoa rims too from champion mustang,can't wait to get theme . Shelby will not be making the SuperSnake rims themselfs, They are going with a new style of rim. Get them while you can. I was thinking of getting a extra 20X10 and 20X9, just in case. Right now, I'm getting the car ready for World Of Wheels. I need to make some of the props that KITT had to along with my display. Any close up pictures of any props would be greatful. Also, car show season is over here, KITT was in 12 shows and won 9 times. Not bad. We are also starting to look at houses back near Chicago so we can leave this place. One has a unfinish basement and it would be a great place for KITT's 29 Trophys. When is the chat room going to be back up, I miss it. They will probably run with the Alcoas until they run out, so like i said the Alcoas will be limited because Shelby might buy up the remaining Alcoas from places like Champion Mustang(since they have an agreement with Shelby American) so they will be only available for GT500KR or SuperSnake owners, in case an customer rims gets bent or whatnot. what's up guys im new to this ...im working on my mustang knight rider replica i was wondering if u guys could help me out with some stuff i want the voice box from the knight rider 2008 movie can anyone help? Hey guys, I've been trying to find something on how to change the color on my cluster to blue. Right now their green and the car was special ordered those its a base model mustang it has the my color changing cup holders and floor lights. So any ideas on what I can do? Knightphoenix1 wrote: Hey guys, I've been trying to find something on how to change the color on my cluster to blue. Right now their green and the car was special ordered those its a base model mustang it has the my color changing cup holders and floor lights. So any ideas on what I can do? Hey, Does your car have My Color? If so, then you can go to your setup with the car in park, it will give you three different grids to change colors to the way you want. I have mine to match my blue under the dash pad lights from KITT. I also have the cup holder and floor set on blue too. romeoknight wrote: what's up guys im new to this ...im working on my mustang knight rider replica i was wondering if u guys could help me out with some stuff i want the voice box from the knight rider 2008 movie can anyone help? Send me a e-mail and I will let you know on the ORB and also on some other stuff for your car. Mine is about 80% done. I would think it does. If my cup holders and floor light up. But I don't have the botton on the center console. The two questions to answer on Mycolor- Do you have a 6-gauge cluster with the message center, and do you have the Info/Setup/Reset buttons (which are normally used to reset the tripmeter) to the left of the cig lighter in the dash? If you have those, then there's a good bet you have Mycolor. Push Setup twice, which will bring you to the mycolor menu on the message center. Tap Reset to cycle through the differant Mycolor preset colors (blue's included), or cycle to the custom mycolor adjustment page (in, park or neutral) In that page, you can cycle adjust red blue and green hues on scales of 5 to create the 125 color combos. I only have the 4 gauge cluster. And I don't have the bottons to the left of the cig lighter. But my cup holder and floor light up. Why are you selling your scanners? Anybody want answer this one? Ted what size tires do you have on your KITT's rims?